The weather gods played with the organisers and athletes this weekend. As the rain fell and the thunder rolled around the heavens it was decided to delay the start of the Elite Women’s race by several minutes to let the weather front grumble away and pass over the venue. 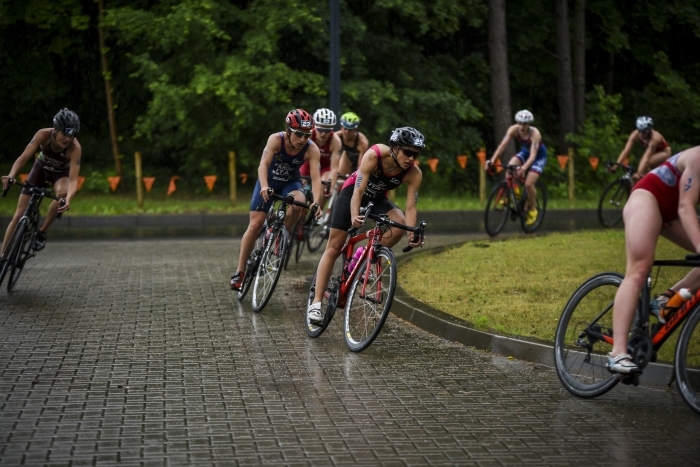 The athletes set up their bikes in the pouring rain as the LOC checked the bike and run course to ensure that all was safe. A nice, clear transition area. A green and pleasant backdrop … but rain. 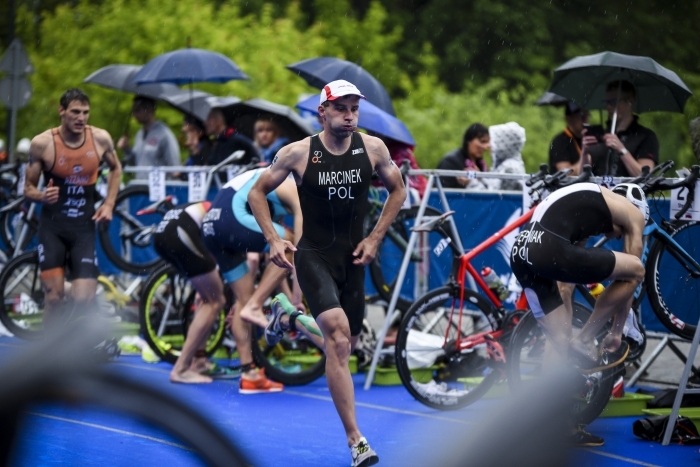 With over 120 athletes racing, this was an impressive start for the Polish Triathlon Federation Polski Zwiazek Triathlonu. 54 female athletes were introduced and selected their positions. Wetsuits on for the one lap, 750m swim. 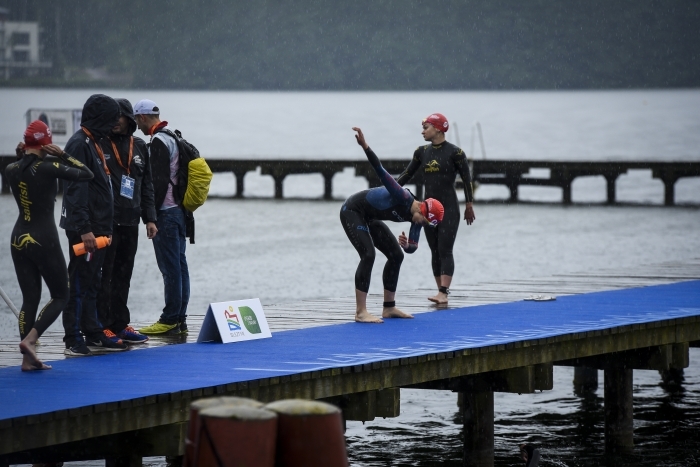 Under the watchful eye of Head Referee, Ljudmila Medan (SRB), the athletes leapt into the lake. High pressure kept the surface nice and flat. 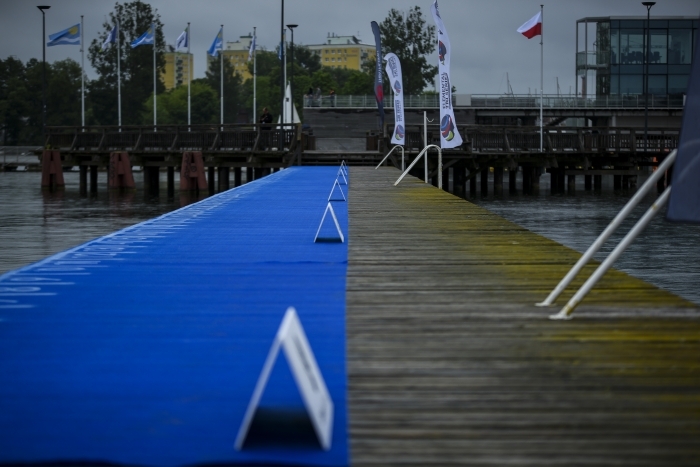 It would be a fast swim, with no wind to challenge the athletes. 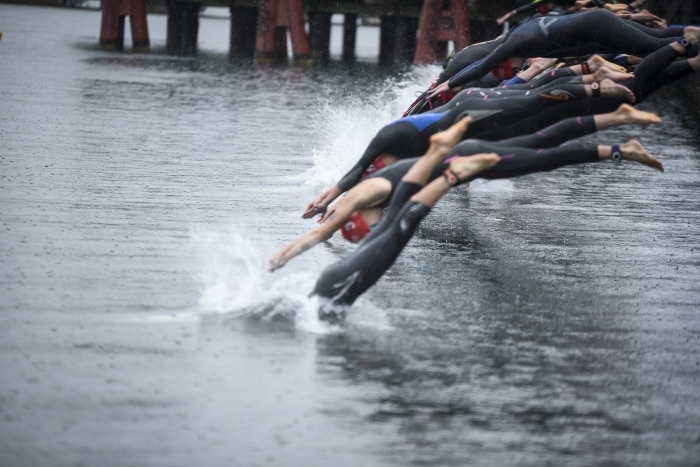 An early lead on the right hand side of the pack was soon chased and caught by the pack and as they rounded the first buoy there was a leader but no real breakaway. 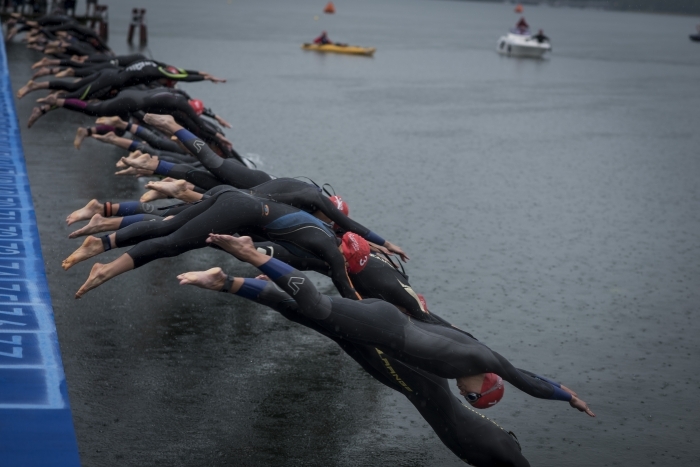 With a beautiful backdrop of dark green forests, the athletes began their journey back to the final turn buoy and then to land. 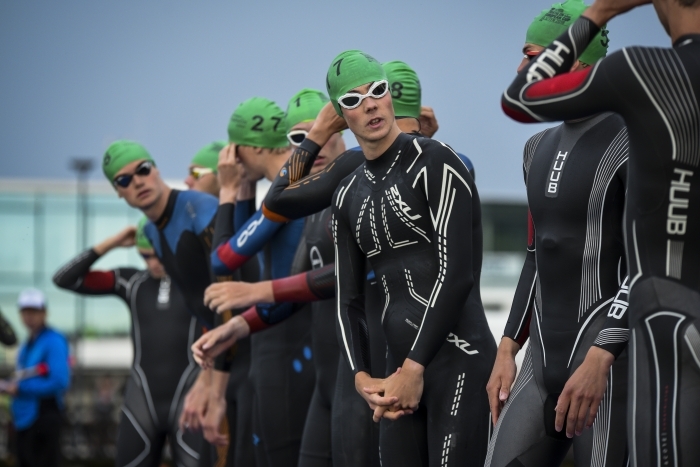 With a small pack of eight athletes just managing to create distance between them and the chase pack, it would need absolute focus in T1 to avoid any penalties. The crowds cheered loudly as it was a Polish athlete, Alicja Ulatowska who led them up the beach. On her toes was Russia’s Nadezhda Malakhova. 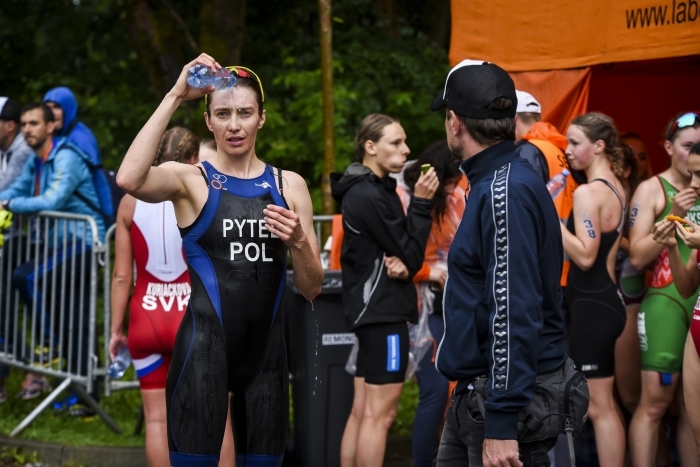 Dorka Putnóczki HUN was just ahead of Roksana Słupek and then came Russia’s Ekaterina Matiukh whose perfect transition took her into the lead out on the bike. 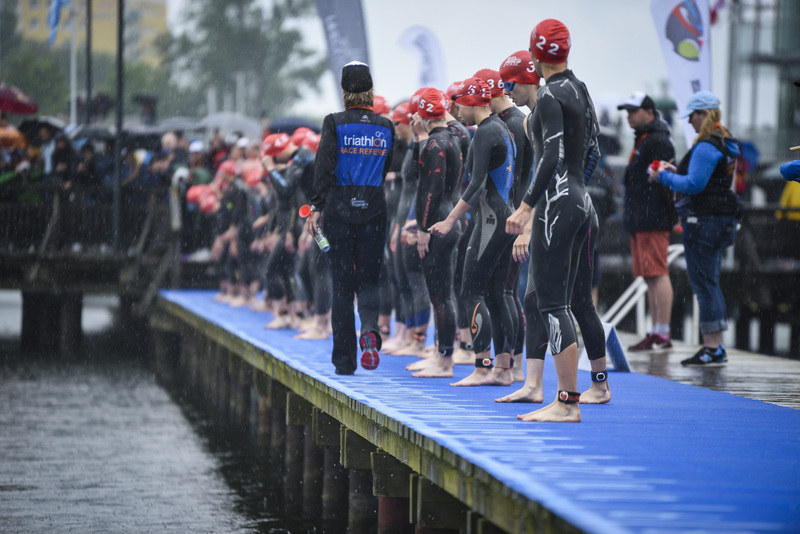 Click here to see the Elite Women come into T1. 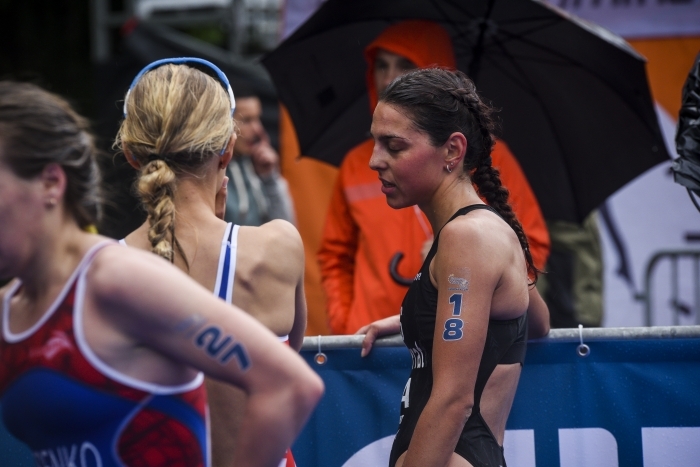 The conditions out on the flat course were pretty awful, with rain coming down and spray from the standing water flying up into the faces of the athletes. 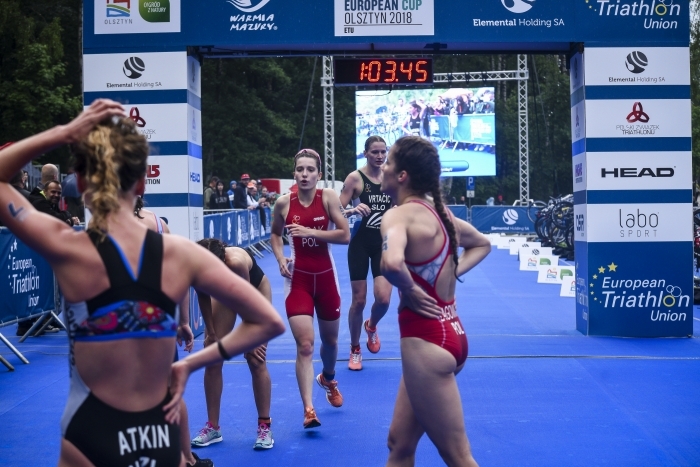 In the chase pack, Yuliya Yelistratova was working hard and pulling the pack along towards the leaders, but ahead Matiukh was working well with Putnóczki and Spain’s Marta Sánchez Hernández. These three worked well together and hit the turns well. Behind them, the larger group entered and left the turns with greater caution and lost valuable time. This could really work well for the leaders and for Matiukh who can run well off the bike. 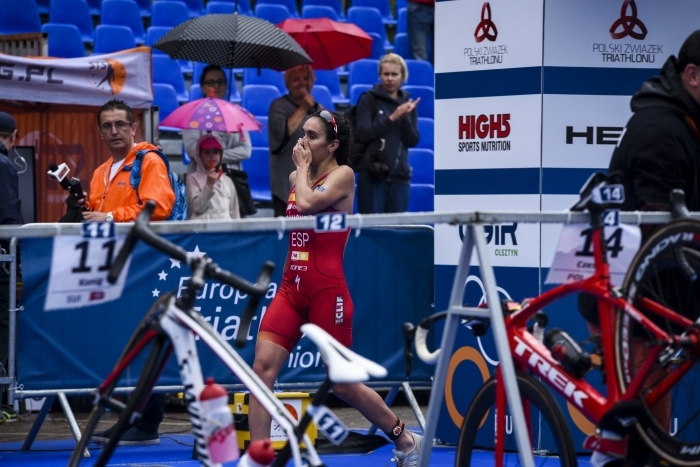 Sánchez Hernández crouched low over the bars each time she led and although they all took turns at the front, it was Matiukh who naturally led. Three different riding styles but three athletes pushing hard ahead of the massive peloton. A 35 second lead at half way suggested that the medals could well be shared between the leading three athletes but amongst that chase group were some fast runners. Nina Eim GER did her best to pull the chase group along. 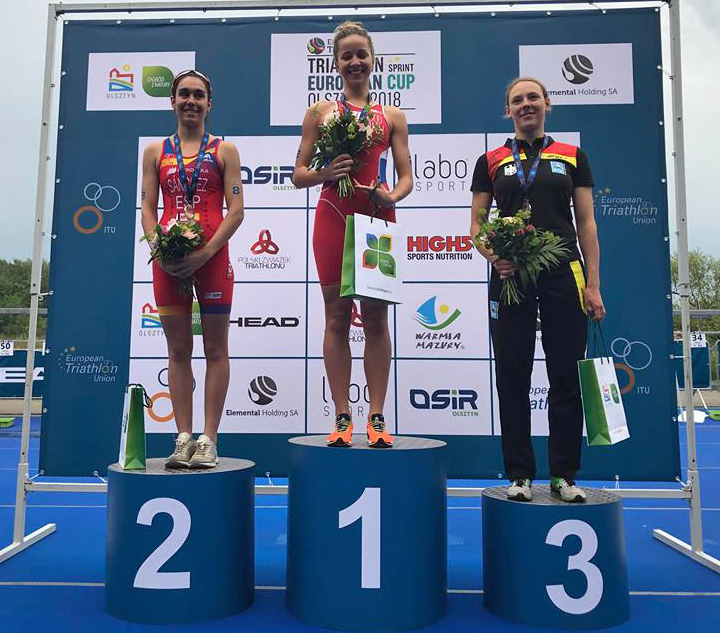 Between her and Yelistratova, there was some run pace but when previously Eim had raced against GB’s Zoe Thomas, it was the Welsh athlete who certainly had the edge but a bad bike ended her race before T2. The 20-strong peloton was still struggling at the turn points on the slippery road as the rain continued to fall and as the laying water on the roads increased in size. Between the leader and the last on in the peloton, it was taking them almost 20 seconds to get around the turn. As the leaders began their final lap, their lead had grown to a massive 54 seconds. With their coaches screaming out the splits, they must have been confident that the medals would stay with them. 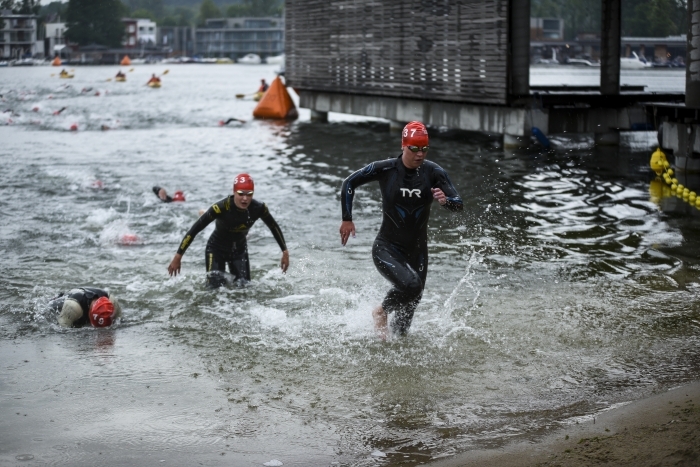 In the final couple of kilometres to T2, the leaders chain-ganged efficiently and then, shoes loosened, they were off the bikes and running to their positions in the transition area. But to everyone’s amazement, as they left T2, the chase pack had upped the speed and were beginning to head towards the final turn that would lead them towards the blue carpet. Eim led them in. Yelistratova had dropped right off the pace, as she took evasive action to avoid crashes in front of her and as the inevitable happened and she too hit the road, it looked like she was having technical problems with her bike. 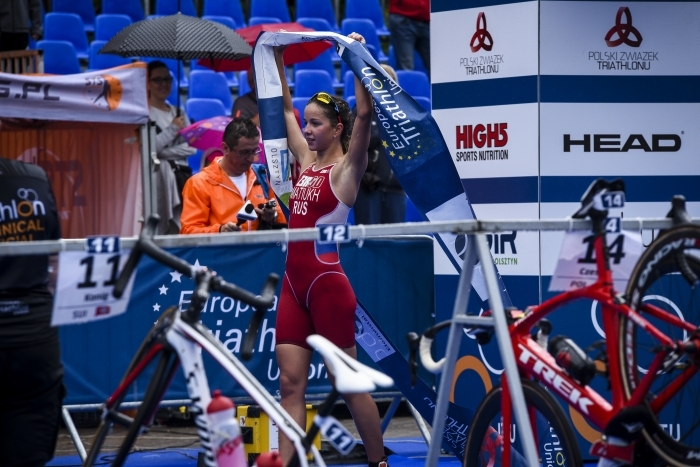 Eim was 57 seconds away from the podium. The rain was still falling. 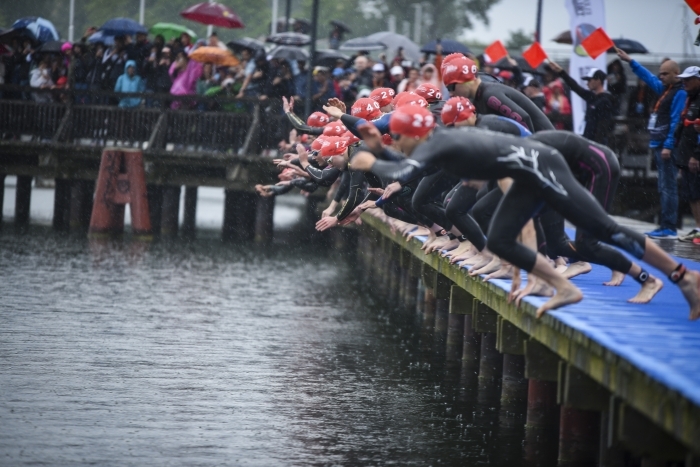 Despite the awful weather there were still many, many people out along the course to cheer the athletes along. 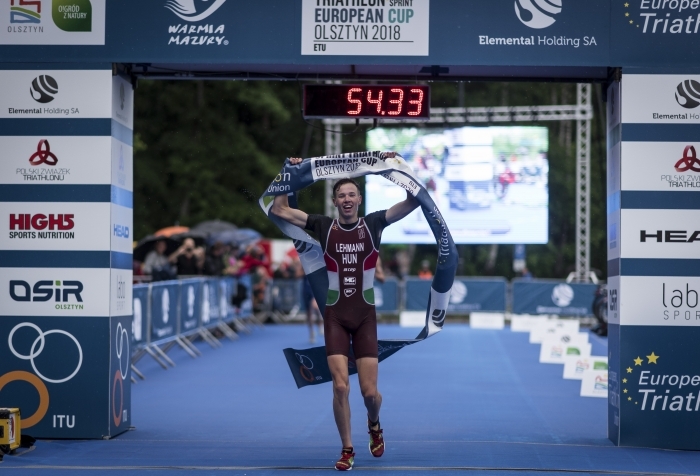 Matiukh was making it look easy and had pulled away from Sánchez Hernández to create a 17 second lead by the end of the first lap. 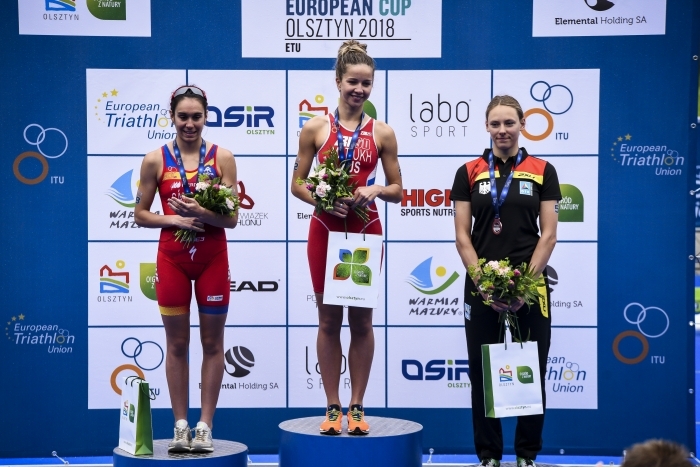 Putnóczki was still holding onto bronze but behind her Switzerland’s Alissa König had broken away with Eim. The final 2.5k lap and the out and back course, gave Matiukh every opportunity to check out who was behind her, how far back they were and how they looked. The König / Eim combo looked good. They were running easily and soon caught up and passed the Hungarian. Would they be able to catch the Spaniard too? One thing looked pretty certain – Russia’s Matiukh had the victory. 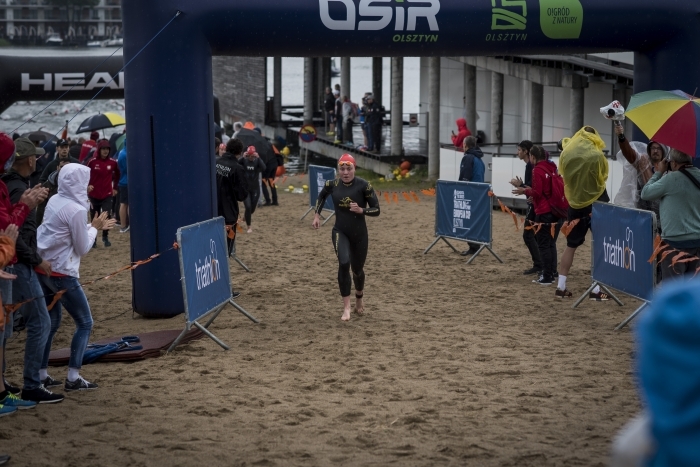 With the finish line in sight, she made her way to the turn, a glance behind her told her what she needed to know and as she rounded the final turn, the bike led her towards the blue carpet and her victory. A smile from ear to ear. The finish tape, more of a challenge than usual, held high. 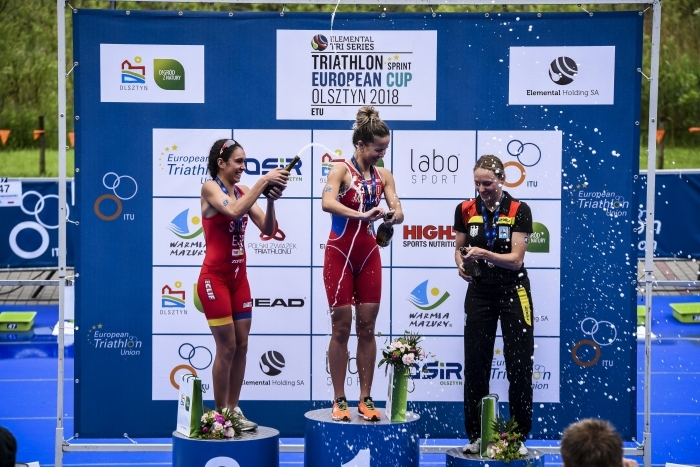 Behind her Sánchez Hernández, with a massive improvement on her 7th place in Melilla, took silver with a fine finishing run from Eim to take her to the remaining place on the podium. To the screaming delight of the Polish supporters it was Słupek who came home in 5th, behind König. 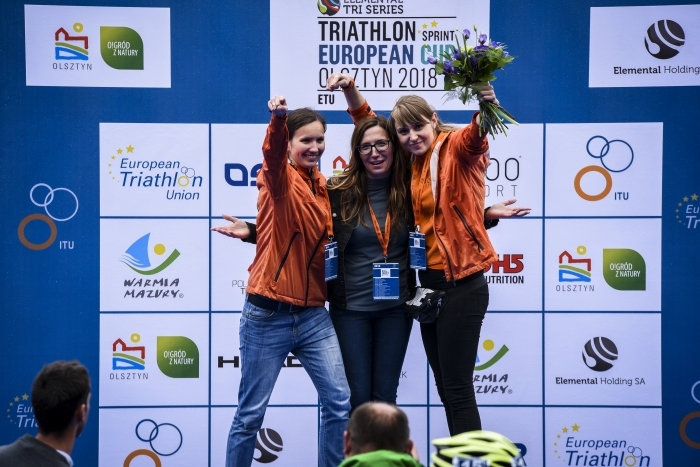 An incredibly tough race but the breakaway had worked and, having done the lion’s share of the work on the bike, it was right and proper that Ekaterina Matiukh should take the victory and that, having finished the race, the rain should stop. 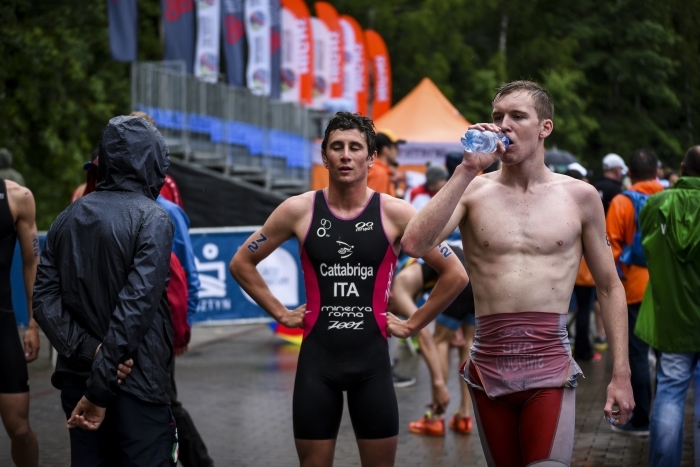 The Elite Men’s start was delayed by a few minutes as the LOC caught up with the schedule and now, with the rain gone, the athletes were looking forwards to better racing conditions. There was still a lot of standing water out on the course but overall, it was a different place entirely. 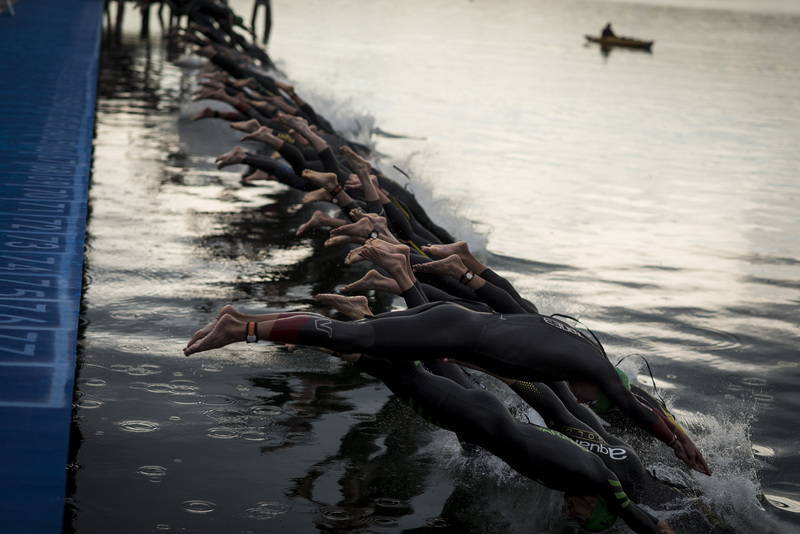 The swim start was clean and the 70+ men hit the water in one go. 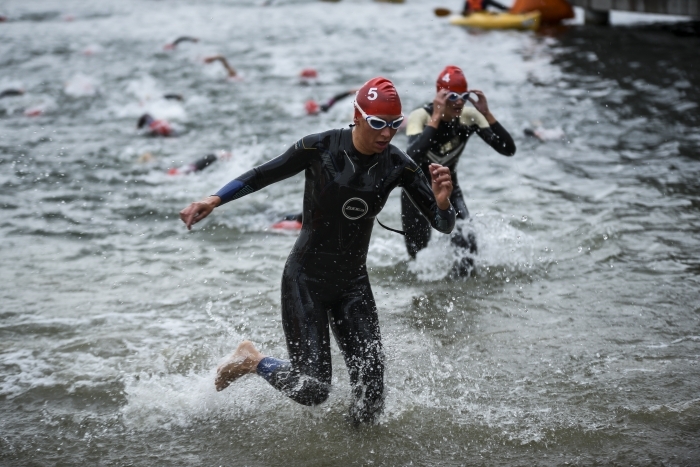 Would we see a Polish athlete lead them out of the water as we did with the Women’s race? 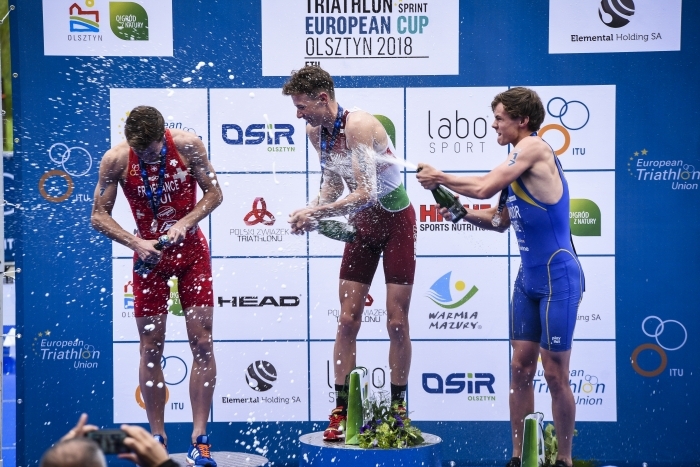 Well, Michał Oliwa would certainly be at the front end of the swim and would be more than determined to get that privilege. 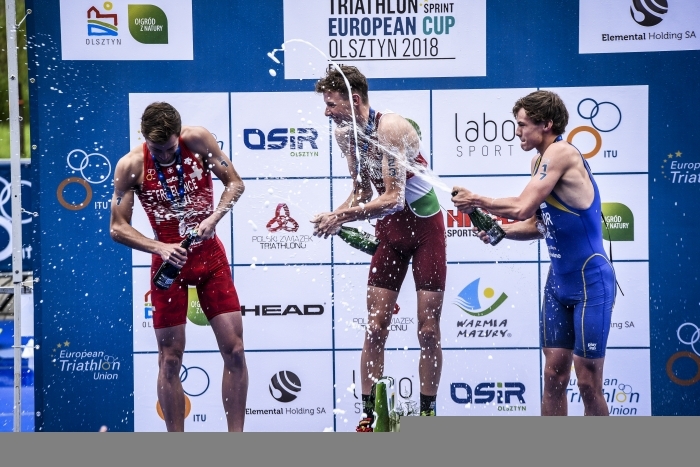 No breakaway in the water but a clear leader by a body length saw the long, powerful pull of Norway’s Jørgen Gundersen take them out of the water and up the beach. 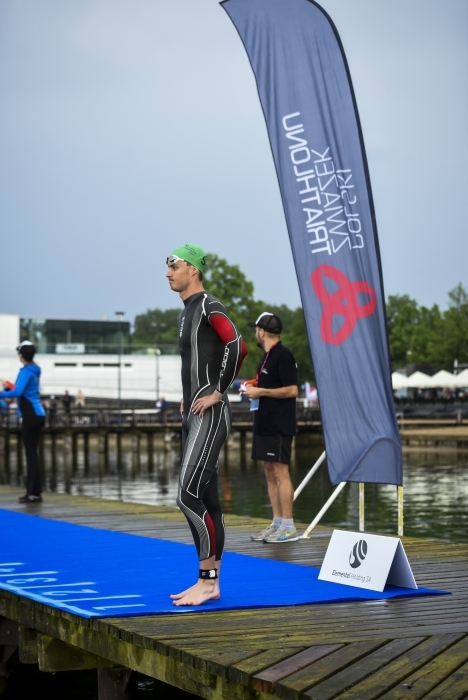 Oliwa was just a few seconds off the pace but made up lost time in T1. 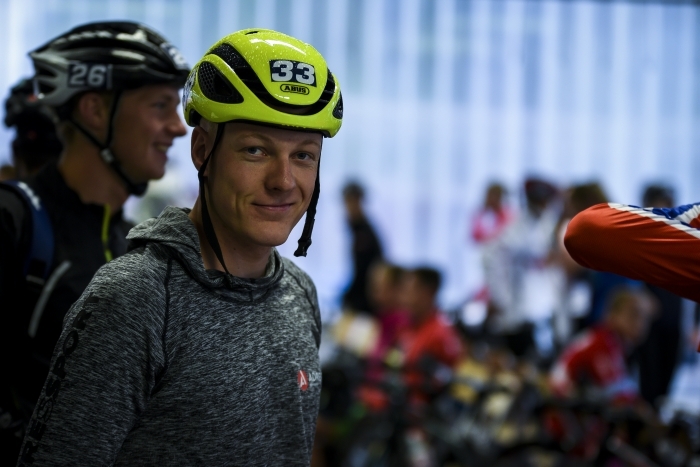 It was Germany’s Lennart Sievers who led them out onto the bike but he was soon joined by a determined group of athletes who, settling their feet into their bike shoes, began to crank up the pace and try to escape the chasing athletes. 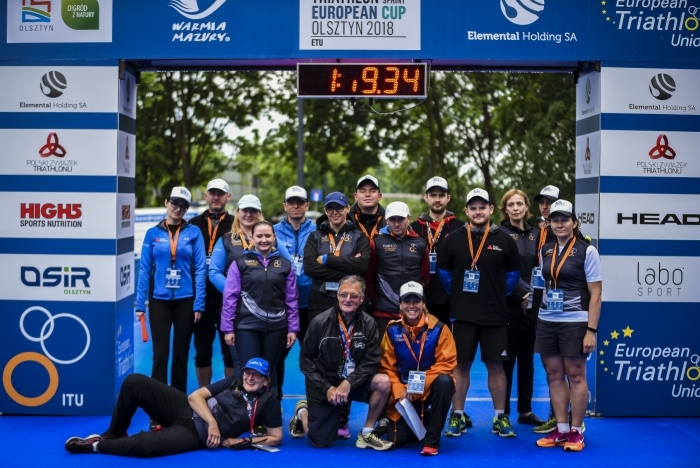 This leading group of Lennart, Gundersen, Oliwa, Nicola Azzano ITA and Csongor Lehman HUN were soon joined by Sylvain Fridelance SUI, Tamás Papp HUN, Jakub Powada POL, Simon Westermann SUI, Max Studer SUI, Marco Akershoek NED and Studer. Tucked in nicely was Aussie, Callum McClusky. A demonstration of precision-riding was given by the leading group of some 20 athletes. As with the Women, the massive numbers meant that negotiating the turns was risky, slow and giving the chasing athletes every opportunity to try and catch. No significant lead was established and at the dead turn, a massive group of almost 60 athletes jockeyed for position. Within the group were some fast runners. Would this be a question of “fingers crossed we don’t crash and then we go all out for the run”, or would this be the sort of opportunity for a powerful breakaway? A four-lap, flat course. Roads still wet with laying water. Calculate the risks. As the dead turns saw athletes come almost to a standing halt, the stronger cyclists were beginning to sort out their strategy. The pack had lost a few athletes by the halfway mark and now, down to 50, it was Oliwa who had sensibly moved to the front end. Fridelance was taking a chance by sitting in the pack. Suddenly it seemed to register that a breakaway from the dead turn might be the chance and an attempt, half way around the third lap, created a small window but this was soon shut down by a powerful attack. 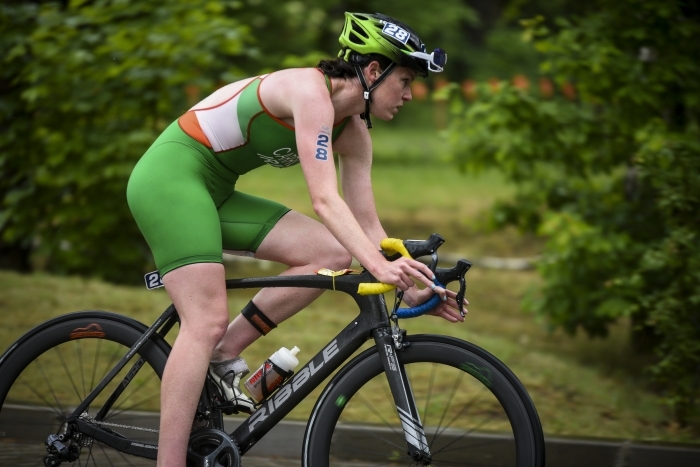 The group reformed and once again, a massive peloton of 50 athletes sped along the roads, bringing smiles to the faces of the dedicated spectators who, despite the weather, were out in good numbers and cheering on the athletes as they flashed past. 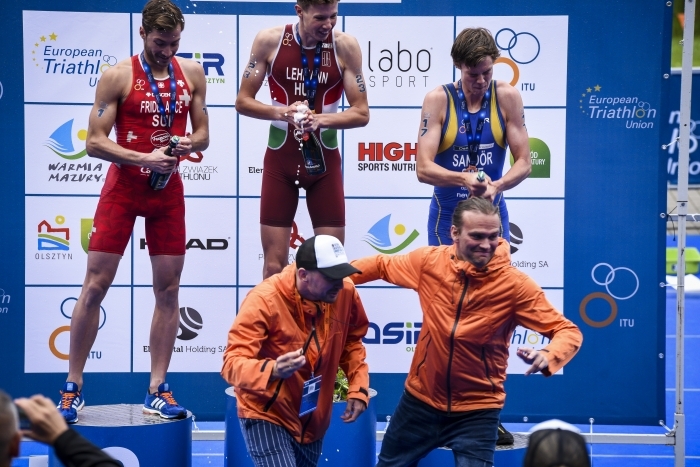 With the bell lap sounding, it was the flying Norwegians Endre Espedal and Morten Hansen who pulled the athletes around the turn. With Csongor, Chris Mintern IRL and Federico Spinazzè ITA, they tried but failed to shake off the heavy presence of the rest of the peloton. The group stayed big but was losing people. Down now to 43, there was only 5k left to split the pack. Staying sensibly at the front, the two Norwegians shouted commands and urged the pace on. Exciting viewing but also, “edge of the seat” viewing as the athletes, packed so tightly on treacherous roads, covered the course at breakneck speeds. 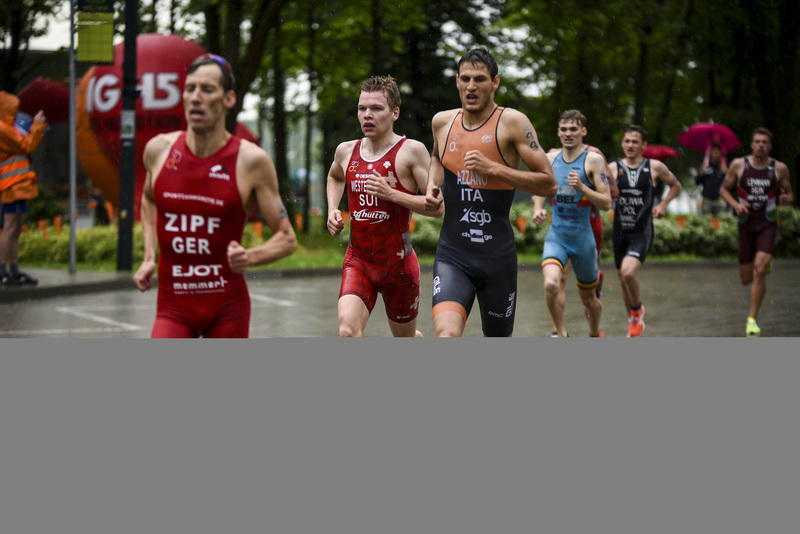 T2 came around and for the Technical Officials, it was a flash of uniforms and bikes and they had gone. 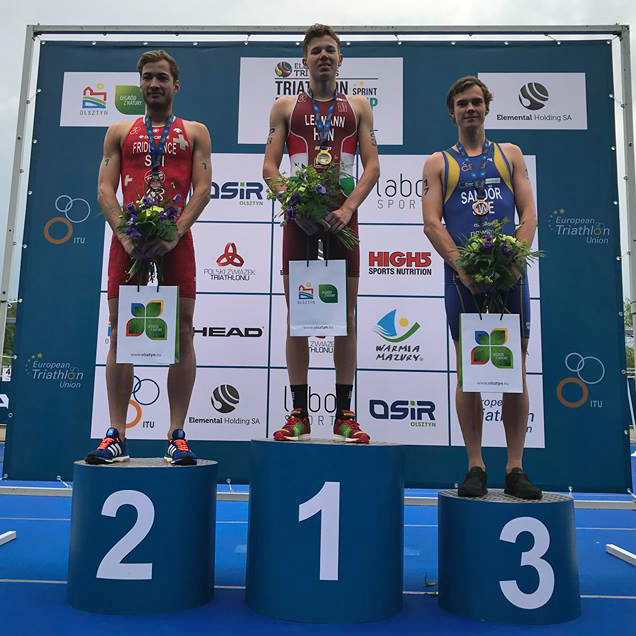 First out was Belgium’s Arthur de Jaegher. On his heels, Espedal. Simon Westermann SUI was there and Csongor. Akershoek, Hansen, Mintern and Alastair Rogers ITU were just ahead of Fridelance. 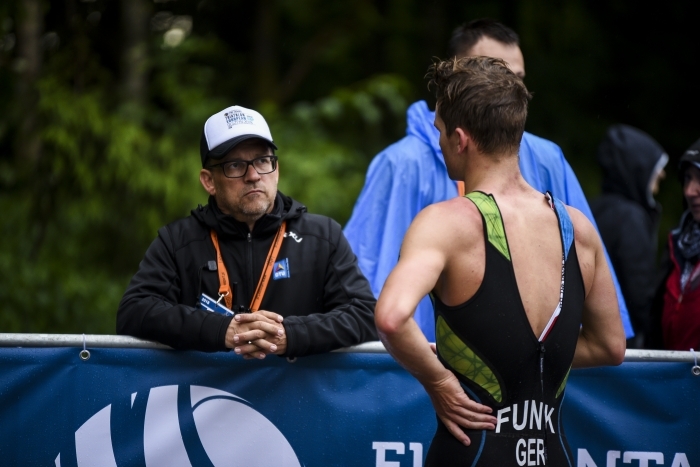 De Jaegher looked strong at the front but behind him, only a few paces, the chasing athletes were checking out his pace, his body language and just waiting to attack. Espedal pounced first. Fridelance moved up and Csongor went with him. A slip at the first turn reminded Espedal just how dangerous the roads still were. Gabriel Sandor SWE joined them. Norway, Switzerland, Sweden and Hungary. They were all looking easy and relaxed. 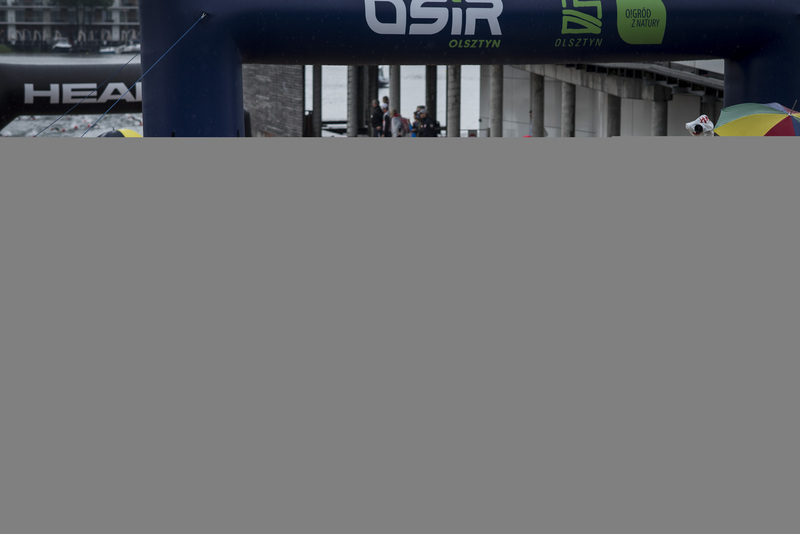 Behind them, cheered on by the many spectators, Oliwa was putting his training to the test and broke away from the pack to try and bridge the gap. Suddenly, with the leaders, was the green uniform of McClusky and the Russian colours of Turbaevskiy. 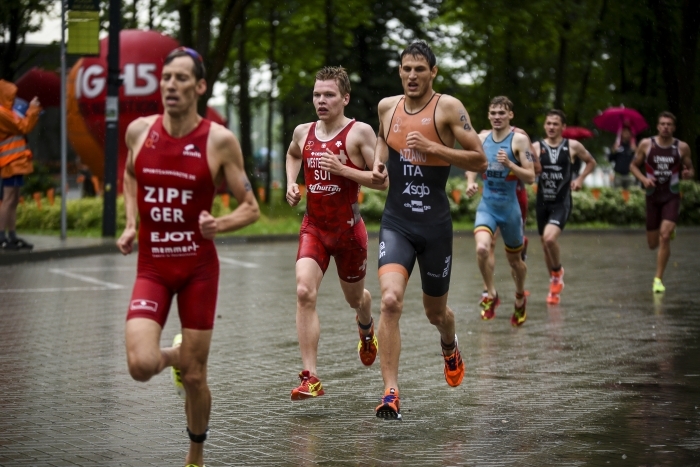 The leaders were Csongor, McClusky, Sandör, Fridelance, Gundersen and Turbaevskiy. McClusky opened up as they started the final lap and pushed the pace. He pulled them away from Gundersen. 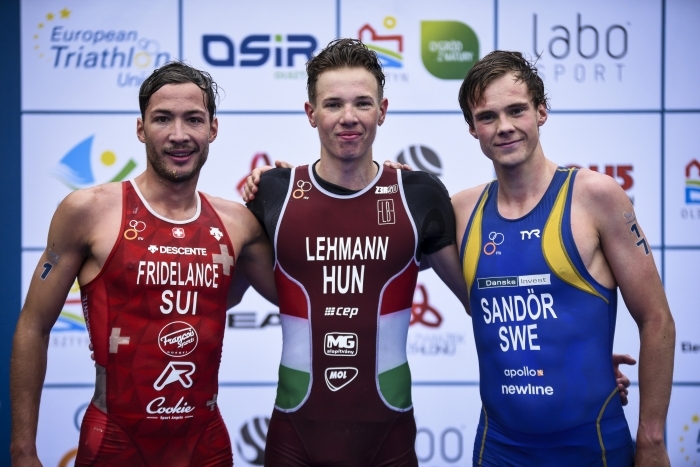 Sandör showed signs that the pace was hurting but somehow dug deep and held on. So, as they neared the far turn, it was Australia, Hungary, Russia, Switzerland and Sweden. 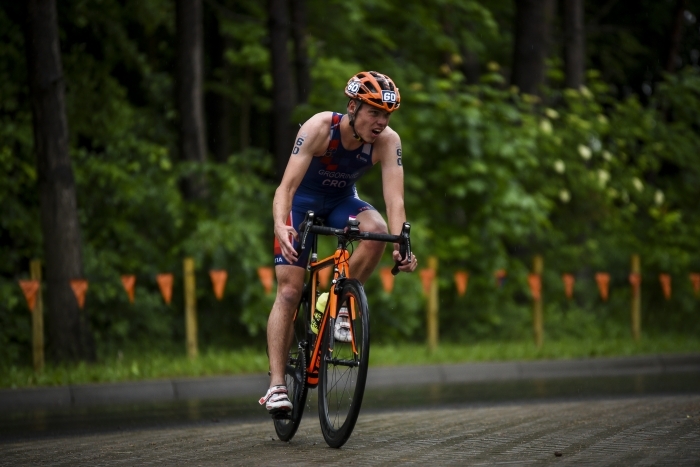 Turbaevskiy kicked on the slight downhill section and led Csongor away from the group. Fridelance, light on his toes, looked ahead and saw a chance as Csongor’s shoulders began to roll with the effort of keeping pace with turbo-charged Turbaevskiy. It was Fridelance who was just able to keep them in sight as Sandör and McClusky dropped. Had the Russian gone too early? Well, the pain across his face suggested he had miscalculated and Csongor edged ahead, with Fridelance and Sandör both passing Turbaevskiy. Coming close to the finish, with the final turn ahead, it was Hungary leading and he was flying. Switzerland was holding onto the silver position but with those closing metres and with the heartrates going way into the red, it was victory for Csongor and Fridelance taking that silver. 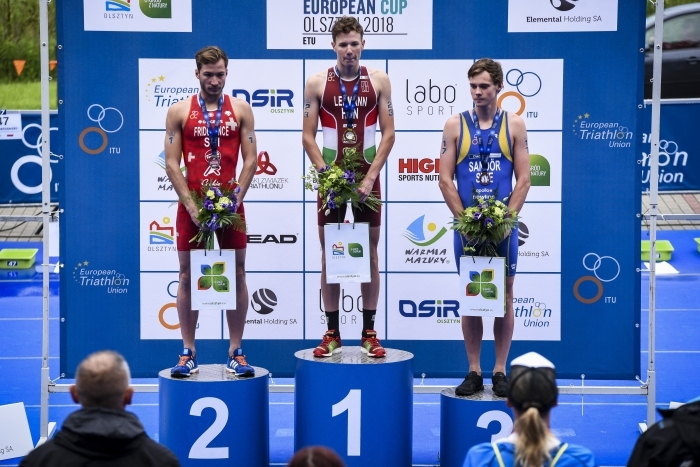 Sandör managed to keep his attack and take the bronze, with McClusky just losing out. Two completely different races. Each one thrilling and each one a huge success thanks to the organisers. 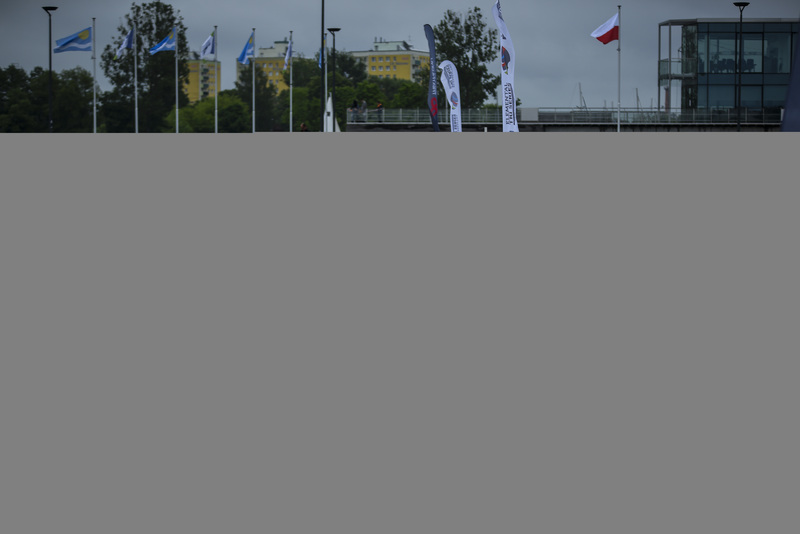 Olsztyn – we are impressed ! 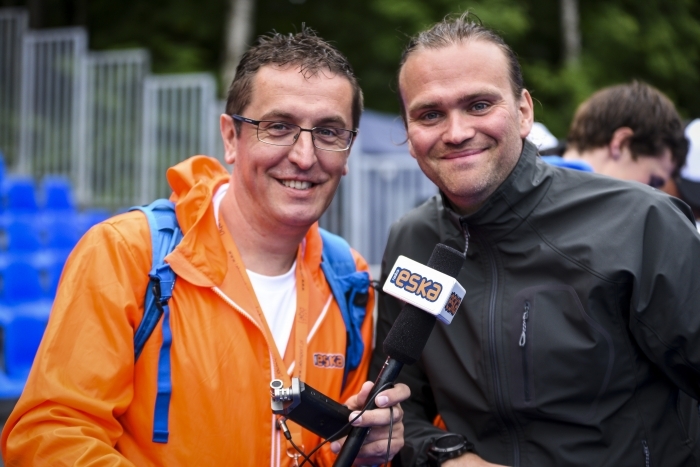 Thanks to Vitaliy Nikitin of the Russian Triarthlon Federation for the videos. Due to the very bad conditions at the race, we only have a limited number of photos to share with you. 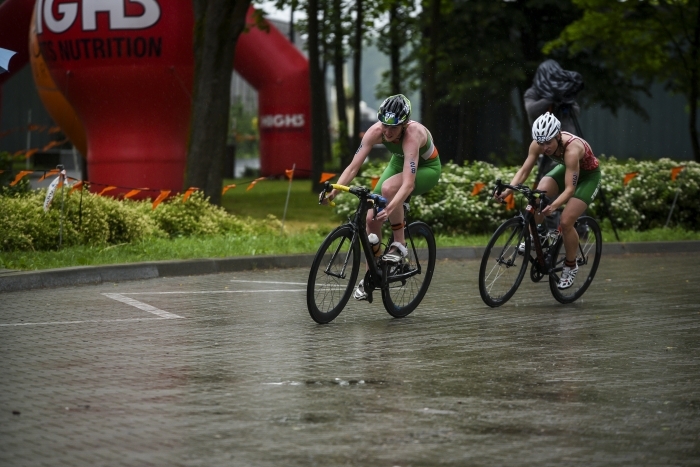 Thanks to Triathlon Series Poland for the images. You can still watch the race here.